NRAO Home > Press Releases > Scientists Celebrate VLBA's First Decade"
Scientists from around the globe are gathered in Socorro, New Mexico, to mark the tenth anniversary of the National Science Foundation's Very Long Baseline Array (VLBA) , a continent-wide radio telescope that produces the most detailed images of any instrument available to the world's astronomers. Nearly 200 scientists are presenting 160 research papers on topics including geophysics, star and planet formation, supernova explosions, galaxies, supermassive black holes, and future directions of research and instrumentation in astronomy. The meeting is sponsored by the National Radio Astronomy Observatory (NRAO) and the New Mexico Institute of Mining and Technology (NM Tech). The meeting is being held on the NM Tech campus in Socorro. 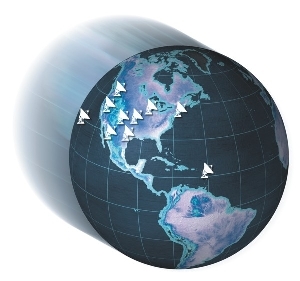 "In ten years of operation, the VLBA has made landmark contributions to astronomy. In this scientific meeting, we are acknowledging those contributions and looking forward to an even more exciting future of frontier research," said James Ulvestad, director of VLA/VLBA operations for the NRAO. "The presentations at this meeting show that the VLBA is being used to study a much broader range of astronomical objects than was anticipated by its designers," said Prof. Roger Blandford of Caltech, who delivered the meeting's opening Keynote Address. Dedicated in 1993, the $85-million VLBA includes ten, 240-ton radio-telescope antennas, ranging from Hawaii in the west to the U.S. Virgin Islands in the east. Two are in New Mexico, one near Pie Town in Catron County and the other at Los Alamos. The VLBA is operated from the NRAO's Array Operations Center in Socorro. Acting like a giant eye 5,000 miles wide, the VLBA can produce the sharpest images of any telescope on Earth or in space. Its ability to see fine detail, called resolving power, is equivalent to being able to stand in New York and read a newspaper in Los Angeles. The VLBA's scientific achievements include making the most accurate distance measurement ever made of an object beyond the Milky Way Galaxy; the first mapping of the magnetic field of a star other than the Sun; "movies" of motions in powerful cosmic jets and of distant supernova explosions; the first measurement of the propagation speed of gravity; and long-term measurements that have improved the reference frame used to map the Universe and detect tectonic motions of Earth's continents. In coming years, scientists plan to use the VLBA, along with other radio-telescope facilities, to gain important new insights on astronomical bodies ranging from nearby stars to the most distant galaxies, seen as they were billions of years ago. The VLBA also will help improve the celestial coordinate system used for spacecraft navigation and other purposes. Blandford outlined a number of future research challenges, including understanding how pulsars produce their powerful beams of light and radio waves, learning how supermassive black holes and their nearby environments produce superfast cosmic jets, trying to understand solar bursts, using gravitational lenses to study the distant Universe, and understanding the mechanisms of gamma ray bursts and their "afterglows." "I am heartened to see the number of young astronomers at this meeting who are using the VLBA and will use it to help answer these important scientific questions," Blandford added. Closer to home, the VLBA can be "turned around" to produce extremely precise measurements on the Earth. This capability allows scientists to study the motion of Earth's tectonic plates, to track "wobbles" in our planet's rotation, and to measure subtle changes attributed to atmospheric motions and climate change. The meeting in Socorro began June 8 and runs through June 12.